Anyone who saw the Sony’s CLEDIS or Samsung’s LED Cinema Screen demonstrations at this year’s CinemaCon could not fail to be stunned by the spectacular brightness, colour and detail of the images. Sadly the audio was far inferior to the images, highlighting the biggest problem (other than price) that LED Cinema Screens will face in deploying in cinemas. Because speakers cannot be placed behind the solid LED modules, new audio engineering solutions will have to be found to achieve 5.1, 7.1 or immersive cinema audio. One such solution is not only already widely deployed today but is also winning universal praise and awards. Cinema speakers have ever since the advent of synchronised sound in the 1920s been placed behind the cinema screen, which is perforated to allow sound waves to pass through, for the critical right, left and centre speaker configurations. These are augmented by speakers on the side walls and back of the auditorium, with a subwoofer off to one side, to create 5.1 and 7.1 surround sound, with added rows higher up or even speakers in the ceiling to creative immersive audio (Dolby Atmos, BArco AuroMax and DTS:X). Placing speakers to the left and right of an LED Cinema Screen would not achieve the same effect, due to the loss of the centre speaker, which is particularly important for dialogue. Yet one exhibitor has rejected conventional cinema audio wisdom as creating inferior audio and visual presentation and has already deployed an alternative solution in well over 100 auditoriums. That exhibitor is Finland’s Finnkino and the solution is known as AS2. It may very well prove critical to the future success of LED cinema screen efforts by the likes of Samsung, Sony and others. We started this because we wasn’t happy about cinema loudspeaker products what was available by major manufacturers. They mostly did had models where sound quality wasn’t main target… it was more like how to make “good enough” with best “sales margin” build with low-cost loudspeaker components. The second frustration was that ‘standard perforation screens’ were open (i.e. had holes) by a factor of 4.4%-6%, depending on the manufacturer. What’s worse was that ‘mini or micro perforation screens’ optimised for digital projection were only 1.7%-2% ‘open’, meaning there was even less space for sound to pass through. Perforated screen also change loudspeaker dispersion significantly and create lots of comb filter effect when sound is bounces back from behind the screen. Perforated screens also affect image quality and can be visible from the first row(s), depending on the distance from the screen. AS2’s solution was to have non-perforated screens and instead of speakers behind the screen, it has custom-made speakers positioned in a special array above the screen. Ari Salenius passed away in 2008, but Jaska continued to develop this system in the decade since. Today it has been installed on close to 200 screens in Finland, Estonia, Latvia, Lithuania, Norway and in one four-screen multiplex in Sweden. Jaska began by having special speakers built to his specification on an OEM basis by a US-based manufacturer. When audio expert Anders Uggelberg left DTS (UK), Jaska approached him about assisting with the design ideas and technical development of the AS2 system. As part of the development process back in 2007 Anders and Jaska spent two weeks in an anechoic chamber (the biggest one in Scandinavia, rented from the US) “just to measure different type of screens, different type of loudspeakers, different type of acoustical material, playing around with digital signal processing, etc.” Jaska remembers. 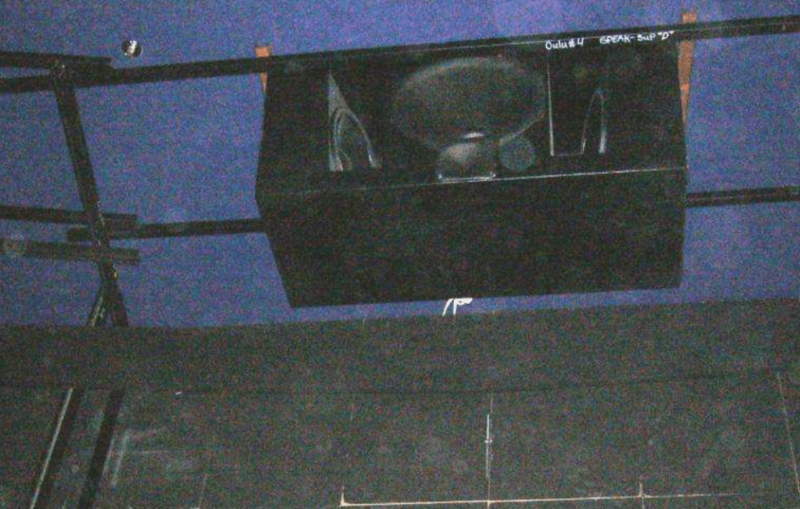 The current speaker, shown below [here: above] during installation in the Oulu multiplex, was selected after extensive measurements and listening test. It is designed by Anders Uggelberg and custom built for Finnkino by a Swedish manufacturer. The loudspeaker is a three-way, bi-amplified loudspeaker with dual 15” woofers and constant directivity mid- and high- frequency waveguides. Power handling is very high, and the total SPL capability of over 130dB @1m makes it suitable in rooms up to slightly longer than 25m. The enclosure has been designed to fit in the limited space above the screen while maintaining the desired directivity. Obviously, moving the loudspeaker enclosures to the top of the screen will shift the sound image from the usual location at 5/8 of the image height to the top of the screen. However, Finnkino has verified that the vertical location has little or no impact in several screenings with professionals as well as non-professionals. A good indication that the vertical localisation is not noticeable is the fact that Finnkino has never received any complaints or comments about the sound location (but many positive reactions to the sound quality). Today there are over 200 shows per day in screens equipped with the AS2 system. The speaker pictured above is an evolution version 3 speaker, but Finnkino is launching evolution version 8 later this month, representing several steps of, well, evolution in its construction, design and performance. Sound performs better when it is not ‘squeezed’ though a perforation, as can be seen in the test patterns above. One of the benefits of AS2 is that it is acoustically distortion free and that you can play movies in reference level 7, the way film makers prefer, rather than the way most regular cinemas play it in 4.5-5.5. By having speakers above the screen in a stadium seating cinema, there is a more even spread and distance between the back and the front row, with thus more even sound pressure levels (only 5dB difference between the first and last row in the Finnkino test). Non-perf screens offer better image quality and screens can also be erected closer to the wall if space is not needed for speakers behind them. 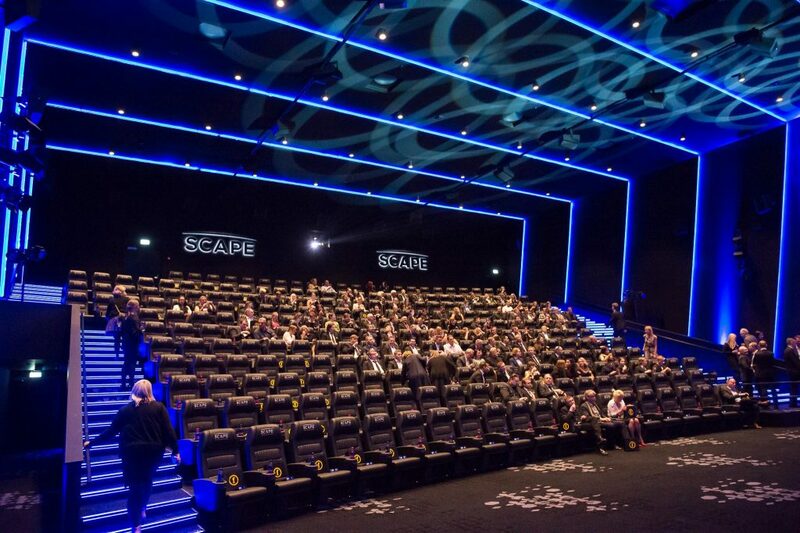 The advantages of AS2 even for non-LED Cinema Screen auditoriums are thus numerous. At least two “high brand name” companies have tried to copy our system a few years ago and both turned out to sound really terrible. Mainly because they thought that you can just mount loudspeakers on top of the screen and that’s it. They didn’t had a clue what it’s about and what you need to consider in terms of design. This is way more complicated to do, how the get sound localization working on screen, etc. AMC tried a similar solution in the 1980s and 90s with a renowned electro-acoustical genius by the name Eugene T. Patronis (Professor Emeritus, Georgia Physics Tech), who has a patent to his name (US 5004067 A) for a ‘cinema sound system for unperforated screens’. Known as the Torus Compound Curved screen, this was a parabolic hard-shell non-perforated screen, designed and developed by the Sigma Design Group, held in place by a vacuum behind it. Amongst the issues was that Torus was ahead of its time, but also poorly implemented, as the audio engineers at the time lacked technical solutions like digital signal processing, correct components, and more. AMC stopped purchasing any further Torus screen in December 1998. There is no small irony that Finnkino is part of Nordic Cinema Group (NCG), which was acquired by AMC earlier this year. So AS2 ultimately now belongs to AMC (Wanda), which could deploy it in its other cinemas or theoretically even license it to third parties. But don’t think that Procella, or anyone else for that matter, can sell you the AS2 solution. “AS2 is a Finnkino product and none of these AS2 loudspeaker models are available to anyone else, except in our own subsidiaries,” Jaska explains, affirming that “it’s exclusively built only for us.” The latest AS2 installation was in the recently opened Finnkino Omena (pictured top and above), 10 km west of Helsinki, in all auditoriums for 5.1, 7.1 and Dolby Atmos. It also happens to be Jaska’s local cinema. Jaska has faced the most resistance internally, at least initially, as cinema is a traditionally conservative business and going against the grain for something as critical as audio is not easy. While he does not say it, there is presumably also a small cost increase in sourcing your own speakers. But the unorthodox method is not just loved by customers but is also winning industry recognition. Finnkino’s Tennispalatsi was recently named the 2017 “Classic Screen of the Year” by the International Cinema Technology Association (ICTA), for its refurbishment achievements as Finnkino’s flagship cinema. The company that nominated the cinema was none other than audio stalwarts Dolby Laboratories. 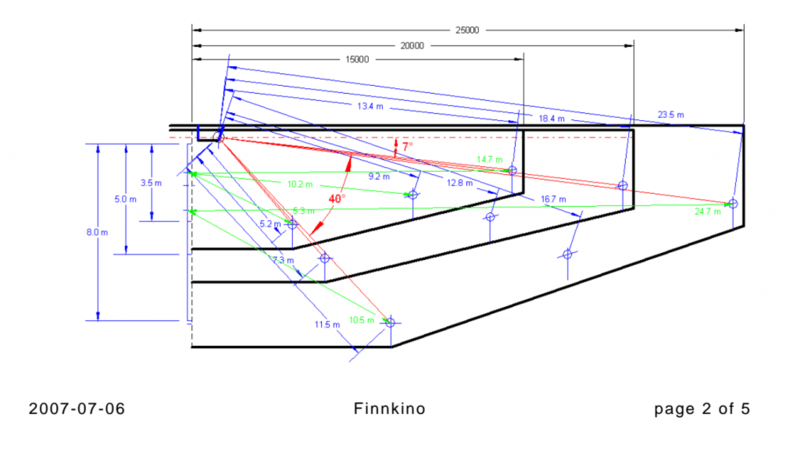 AS2 may be unorthodox, but its has just helped Finnkino win the equivalent of the cinema technology Oscar! Don’t be surprised if Samsung, Sony and other LED Cinema Screen engineers and their audio consultants soon start booking Finnair flights to Helsinki to examine the AS2 solution for themselves. Whether they can implement it as well as Finnkino has is a different question.